On an overcast afternoon, LX and Ancient Britons assembled at the Oxford Hawks ground. The rain that was threatening held off and a very enjoyable game ensued. 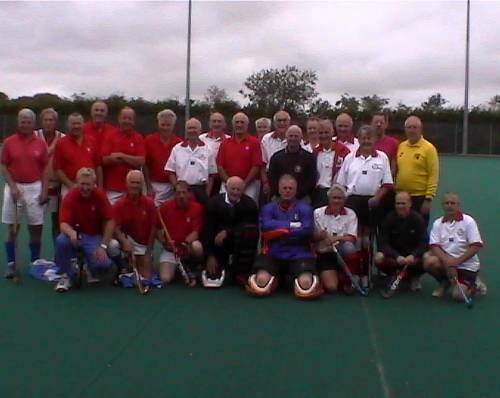 This fixture had last been played in 2000 at Arthur barber’s request to give the LX team some useful practice prior to the European Veterans tournament later that year. The score on that occasion had been 8-1 in favour of LX so the Ancient Britons were keen to make amends. However, it was LX that started the stronger with Chris Jones, Austyn Leaverland and Paul Pech controlling midfield and providing several goal scoring opportunities for the forwards where Gordon Small in particular was prominent. The Ancient Britons defence – which included LXers Paddy Maher in goal, Arthur Barber and Lienel Barnes – held firm and, relieved of their defensive duties, their midfield – including LXer Mike Greenhough – were able to push forward and provide opportunities for their front runners. This pressure led to a couple of penalty corners from the second of which Mike Greenhough’s shot was deflected into the net just inside John Ingram-Marriott’s left post. In spite of a renewed effort from LX, the Ancient Britons retained their lead until half-time. LX pushed forward in numbers at the start of the second half and the Ancient Britons were forced onto the back foot. They managed to weather the storm, however, and began to counter attack quite well but solid tackles and timely interceptions from Colin Pearce and John Longden prevented any further score. The captain, Adrian Stephenson, then made a subtle change to the formation by putting himself and Tony Henman as twin strikers. This had the desired effect of forcing the Ancient Britons to defend in numbers and limiting their opportunities to push forward. LX were unlucky not to score as Paddy Maher was called upon to make several crucial saves. With ten minutes to go, LX eventually drew level; a penalty corner shot was easily saved by Paddy Maher but his fellow defenders were unable to clear the ball from the circle and Tony Henman was on hand to force home the equaliser. The game ended with the score still at 1-1, a fair result based on the balance of play throughout the game. After the match, LX and Ancient Britons players and numerous supporters - including two Ancient Britons all the way from Cairns, Australia – were treated to excellent hospitality for which our sincere thanks must go to Richard and Sarah Clarke and Dave and Judy Robson whose efforts over the previous couple of weeks had ensured the success of this fixture in spite of the difficulties caused by the refurbishment of the Oxford Hawks changing rooms. Thanks also to Dave Robson and Gordon Boulter (Ancient Britons) whose sympathetic umpiring contributed to the enjoyment of the game.